Tyres are one of if not the most important part of your vehicle as it is your only point of contact with the road. There are many things to consider when ensuring your tyre is safe to use. The main things to check are that you have the correct tyre pressure, your tread wear is within the legal requirements and that there are no bulges or abnormalities. Paying special atteintion to any tears or cracks in the tyres wall. If your unsure drop in and let us check it for you. Your exhaust can become damaged or corroded which in turn can cause a leak. This leak can cause your vehicle to experience perfomance issues. The issues can vary from a decrease in power or acceleration or fuel efficiency the most noticeable being a loud roaring from the silencer or hissing from the front manifold. Catalytic converters must be working correctly to ensure your car is not emitting illegal amounts of fumes into the atmosphere. Brakes show many signs of possible failure and as they stop your vehicle should be checked regularly around every 6 months or so. Some signs of wear include poor braking performance, squealing, grinding noises, pulsation in the brake pedal, clicking noises or car pulling to one side whilst braking. Other more obvious signs ABS light on, excessive drag when you accelerate or even complete loss of brake pedal control in any of these instances call us for a quote. A few signs that your battery is not working normally. Electrical systems are usually the first things affected by battery wear, you may notice your car’s radio, lighting and windscreen wipers may act differently than beforehand. Another sign is a strong smell coming from the battery often likened to rotten eggs. This is caused by your battery attempting to ‘overcharge’ itself. This is often as a result of a fault in the charging system and can cause the same thing to a brand new battery. 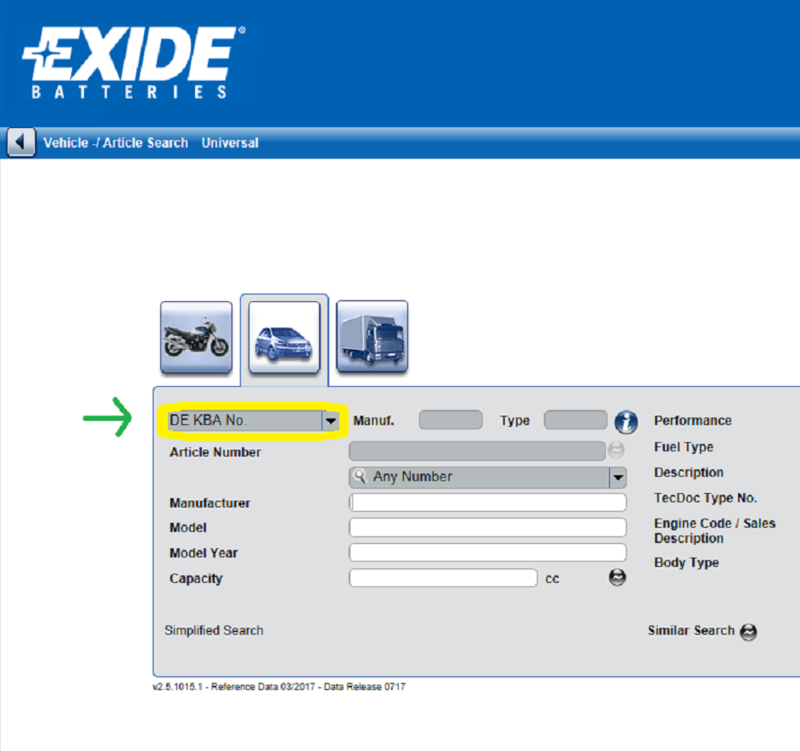 To find your battery click the Exide Battery button below to go to the Exide Catalogue. To search by vehicle registration you must click the arrow on the highlighted box in the image below and select 'GB VRM' the default will be 'DE KBA No' as shown in the image below. NOTE: if you leave the default selected it will not find your vehicle. Defective tyres are illegal and can end up with you getting points on your licence. Don't risk it come and get your tyres checked today. If you have a juddering in your steering wheel your wheels could need balancing pop in and we can balance them while you wait. Laser wheel alignment to within 0.1mm precision. Having your wheels aligned properly can save on tyre wear and increases fuel economy. If you have alloys or steel wheels that need replacing come and see Falmouth tyres for a free quote. We can fit them while you wait. If you have lost your locking wheel nut key do not worry. We can easily remove your locking wheel nuts and replace them with a new set. Allowing your brake pads to wear too low can cause damage to your discs and end up costing you more to repair 2-3mm or less need checking. Full exhaust systems supplied and fitted at a very competitive price. Front, mid and backbox replacement most makes in stock. We stock Exide and Platinum batteries ready to fit while you wait. We fit batteries on cars, vans and motorhomes. We stock a good range of automotive and leisure batteries. Falmouth tyers has a plug in diagnostic kit so if you have an engine management light that won't go off, let us find out what the issue is.